It seems as if it's been raining nonstop for the past few weeks, and when it's not raining, it's drizzling or just about to drizzle. All this water encouraged the growth of lots of moss and even more lichen on the trees in the garden, which actually was really great to see, as they provided bright spots of color in what's otherwise been a gray landscape. Lichens, as you'll recall from biology class in sixth grade, are a combo of a fungus and an alga (or a blue-green alga, which isn't an alga but a bacterium--are you with me? OK then), with the fungus providing structure, carrying out reproductive and dispersal activities for the team, and soaking up moisture while the alga pays the rent by photosynthesizing food. Full disclosure: In a moment of supreme hubris, I assumed that identifying these lichens would be easy-peasy. Really, how hard could it be? Unlike birds, these things just sit there, right under one's nose. Grab a guide book, matchy-matchy, ID it, bingo. Turns out, unless you're a lichenologist, you're unlichenly to identify one that easily. My northwest field guides were useless. Few even bothered to include lichens, and the ones that did only featured a handful, none of which looked like my lichens. Or rather, the apple tree's lichens. I'm glad that when it arrived, I had no other books to tote home, because it is a doorstop: It's 800 pages long, two and three-eights of an inch thick, and weighs just shy of 9 pounds. And it's stunning. Flipping through the pages, you'd swear you were enjoying a coffee-table book about coral reefs. Which, as a matter of fact, are beautifully colored thanks to the algae living in the coral polyps, reflecting what's going on with the lichens on land. However, I haven't made much headway in figuring out the lichen. The gray-green one is surely some type of antler lichen, based on its shape, not that it takes a brainiac to figure that out. It may be a variety called oakmoss lichen, common in Europe but restricted to the west coast in the United States. I don't have a clue as to what the yellow-green lichen is, because it does not look like anything in the books. I doubt that means I have some stunning rare species in my yard. That much I've learned from birding. Last time I thought a rare bird showed up at my feeder, I was gently informed by the folks at the Cornell Feederwatch program that it was a fabulous sighting but nonetheless not atypical for our area. Oh, and there was that beautiful flower that sprouted in the garden last year that made me think a rare orchid had volunteered there, only to find out while researching it that it was a dreadfully invasive species and needed to be ripped out, beaten with a board, set on fire, and then taken 400 miles offshore and fed to a shark. I did learn, however, that the people who came up with the common names for various lichens over the years appear to have had a lot of fun. You know how they hire people to come up with names for paint colors and cars? 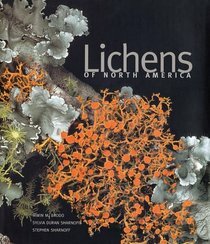 I want to get the job of naming lichens. Below is a picture of the lichen-and-moss-draped trees we saw in the Hoh Rain Forest last year, and below that are the most amazing names gleaned from the Big Book o' Lichens--a total witch's brew mingled with weird diseases, insults, and characters from a spy novel.